I know a lot of you are super talented in many ways, but I need the gif-y folks now. 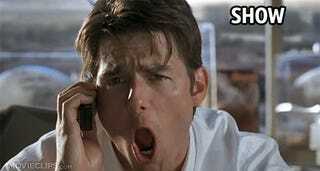 Can anyone make me a gif of the "SHOW ME THE MONEY" scene from Jerry Maguire with the money parts cut out and replaced with an image of a llama? I really want a "SHOW ME THE LLAMA" gif. And I would prefer the Cuba part of the scene to the Tom one.